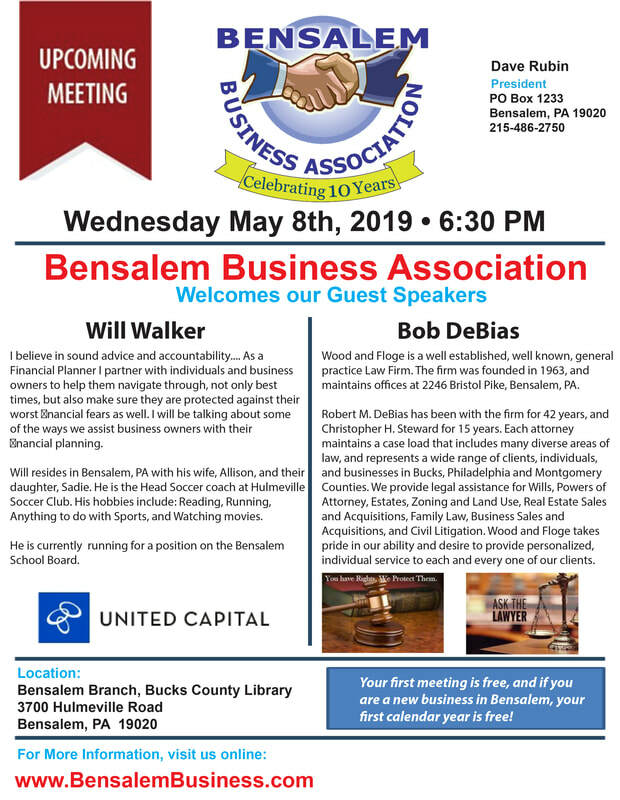 MEETINGS: Bensalem Business Association meetings and business card exchanges will be held on the 2nd Wednesday of every month at 6:30pm, the first meeting is FREE to attend, the second meeting will cost $20 which can be applied towards your membership dues. Any additional meetings you attend will require membership paid in full for membership details, Join Us! Please, RSVP to info@bensalembusiness.com so we are prepared for the correct number of attendees. Board of Directors Meetings held every first Tuesday of the month. At the monthly meetings the President will speak about news, happenings, and topics that involve Bensalem Township and the Association. Afterwards the Guest Speaker will have the floor to either speak about his or her business or to address a topic of great interest. After our short meeting and guest speaker we will have a Business Card Exchange with refreshments. This will give everyone a chance to pass out business cards and network with each other. Meetings are always Free for BBA Members. For Non-Members: 1st Meeting is Complimentary then $20 for the next meeting you wish to attend. Thank you Pete Mavroudis, from Apollo’s Family Pizzeria for the food he generously supplies to our meetings. Working Together to Promote and Support Bensalem Businesses.